Easy Thairu Curry/Curd curry | Simple and Delicious ! Thairu curry is a simple dish which is a good combination with Rice. 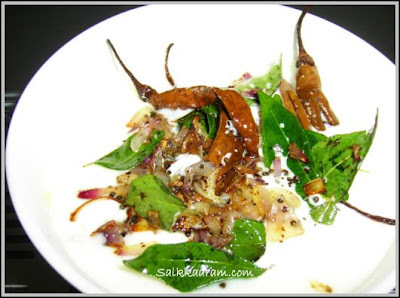 I usually prepare this using kondattam mulaku / chillies soaked in curd and then dried. It gives extra taste. Heat coconut oil of about 1 table spoon. I do not mention the exact amount of coconut oil , since you can take it according to your taste. Fry red chillies or green chillies and chopped onions. 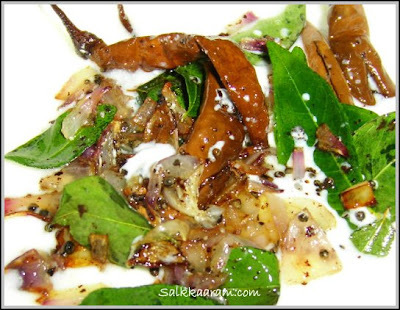 When the color turns brown add curry leaves. You can try this with tomato also. Adding chopped tomatoes give extra taste and color. Can we do this recipe with mour mizhaga? Anon, I didn't understand what you mentioned..
doesnt the curd split when addded ?? ?